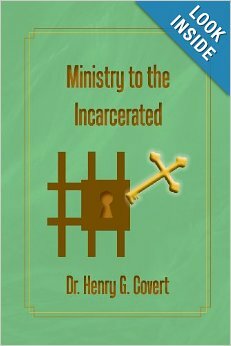 We received a letter from Henry G. Covert introducing his book, “Ministry to the Incarcerated,” as a guide to understanding the prison environment and ministry to inmates. In Ministry to the Incarcerated, Dr. Covert uses his experiences as both police officer and retired state prison chaplain to examine the problems of the incarcerated, specifically the stressors which are obstacles to a prisoner’s personal and spiritual development. In his analysis he provides both secular and biblical themes that promote penal reform and offender rehabilitation. Ministry to the Incarcerated also provides instructional outlines for staff and volunteers, as well as Dr. Covert’s experience being the chaplain for Pennsylvania’s first execution in 33 years. Dr. Henry G. Covert is an ordained minister with the United Church of Christ. After a tour of duty in the military, he worked in law enforcement for twenty years as both a patrol sergeant and county detective. Toward the end of that career he began his studies for the ministry. He has pastored several parishes, worked as a counselor in therapeutic communities, was a state prison chaplain, and acquired adjunct faculty status at the Pennsylvania State University. Reverend Covert was the chaplain for Pennsylvania’s first execution in thirty-three years. He holds several academic degrees in the Scriptures and theology, including a doctorate from Pittsburgh Theological Seminary. He is the author of six books: Ministry to the Incarcerated, Discovering the Parables: An Inspirational Guide for Everyday Life, Spiritual Reflections: A Journey through the Scriptures, Christian Beliefs and Prayers, The Crucifixion of Jesus, and The True Church of Jesus Christ. This book is for everyone who has an interest in law enforcement, the penal system, and rehabilitation and ministry in the prison system.